Black Hogg (LA – Silverlake-$$$) – Whenever I read the words HOGG in any title with the insinuation that pork is on the horizon, my face lights up like a bulb with joy. 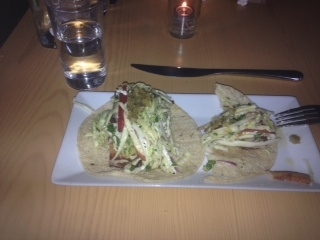 For all my pork lover brother and sisters I encourage you to start the night off with the “popcorn” bacon, where the first bite reminds you eating a waffle with syrup, but it happens to be fried & if dessert is on your mind as your entree try the pork belly taco that is the absolute perfect portion and in an effort to make you feel like you are not dishonoring your diet completely it is served with apple slaw. Now in keeping it honest, I must write when I think of bacon, I think salty goodness with fat; Black Hogg cures their own bacon, and it lacked the saltiness that my taste buds desire when bacon is coming in for the kill, it didn’t make it less good, it just made me feel less glutonises which is not necessarily a bad thing. 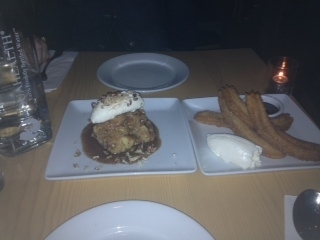 When it comes to desert I promise you will feel like you either need to walk home or do double sessions at the “Fit Factory” (Melrose Ave) with that being written you MUST try the homemde churros & bread pudding…yummy..i digress. As I said this place is small and opens @6:00 pm, but if you want to get a seat arrive @ 5:45 pm at this no-reservation zone. Black Hogg offers old school BYOB with cork service…yes I wrote it – BYOB (BRING YOUR OWN BOTTLE)…going on a date, go to Black Hogg! going to dinner with food lover(s), go to Black Hogg! going with girlfriends who really know how to eat, go to Black Hogg! got some friends who just wanna eat chicken…go to Black Hogg! but if you wanna take your kids, DON’T go to Black Hogg, this should be an adult zone only…BLACK HOGG YOU HAVE MY DELICIOUS VOTE!! Go Pork you indeed are the super meat. Would like a better or clearer pic. Other than that I would li to try the place.